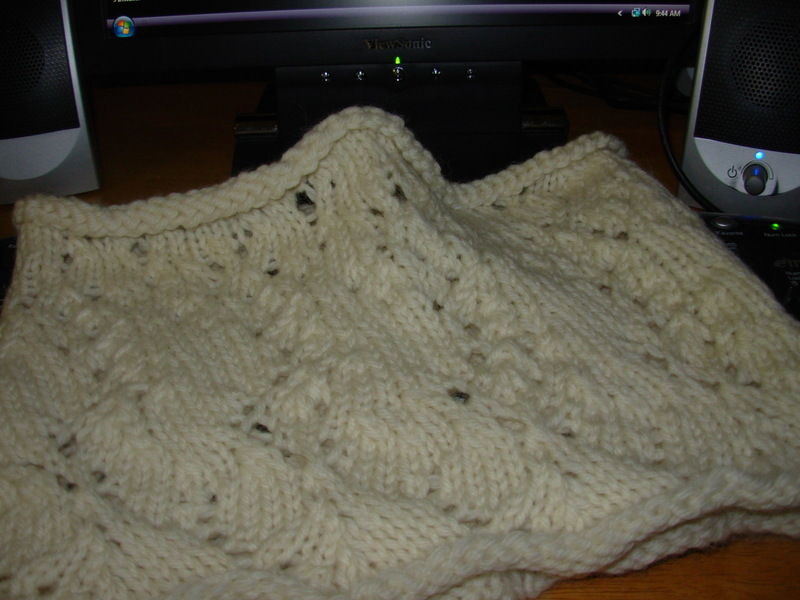 This was a great knit – interesting yet easy enough to do at work (and it’s busy busy busy right now). I used Knit Picks Bare Peruvian Wool Bulky and Knit Picks Options Clear Size 7s. The pattern can be found on ravelry thanks to Linda Frydl. Since my hands are always cold, I’m making some bulky fingerless gloves to match. One down and one to go. Since I’m using bulky yarn and don’t have appropriate dpn’s I’m knitting them flat, 28 sts with a 3×1 rib then st. st. up to end then rib again around fingers. I may do some crocheted lace around the thumb, fingers and arm edges but haven’t quite decided yet. I did a trial run glove and liked it with the lace so… let’s see how the day goes. Maybe I’ll have more to post later. 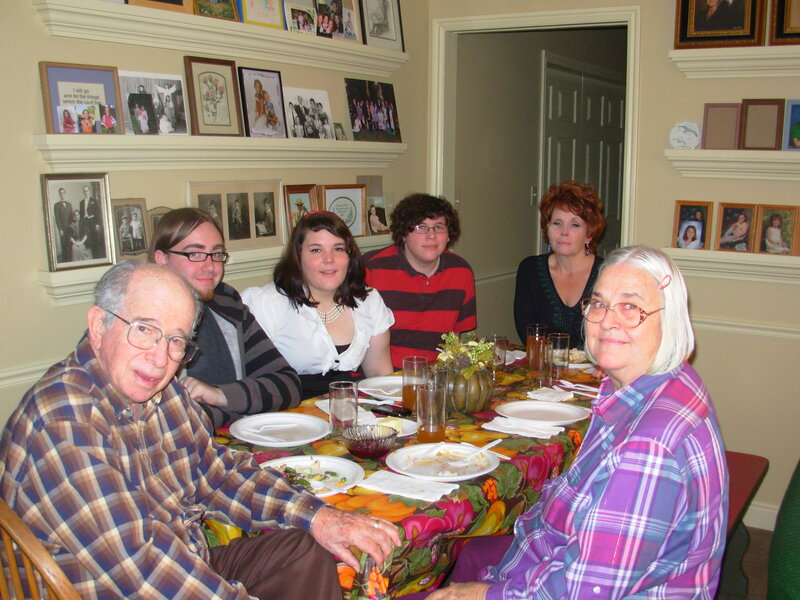 I finally am getting around to posting a Thanksgiving ’09 pic. Yes, I look drugged. 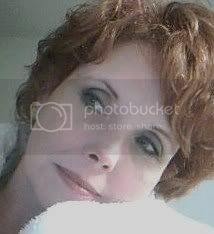 That’s when I had bronchitis (which is lingering but getting better, btw) and was stifling coughing fits. 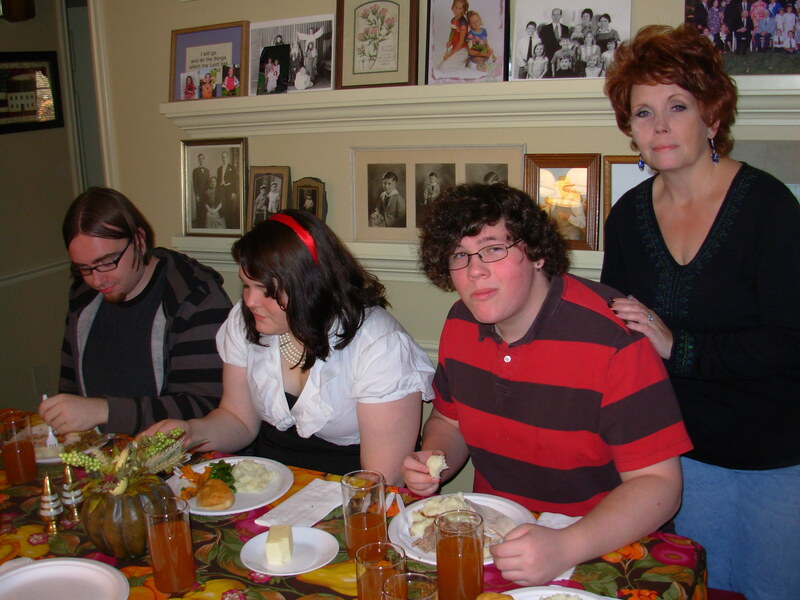 In the forefront are my wonderful parents, behind Dad is Dylan (Marci’s significant other), then my daughter Ian Marici (Marci) then David my son, then moi. Just in case it’s ever in question – NO – David does NOT like having his picture taken. Particularly not when his mouth is full. And yet, he looks great! On Thanksgiving, I took a few photos of things at Mom’s that are meaningful to me. 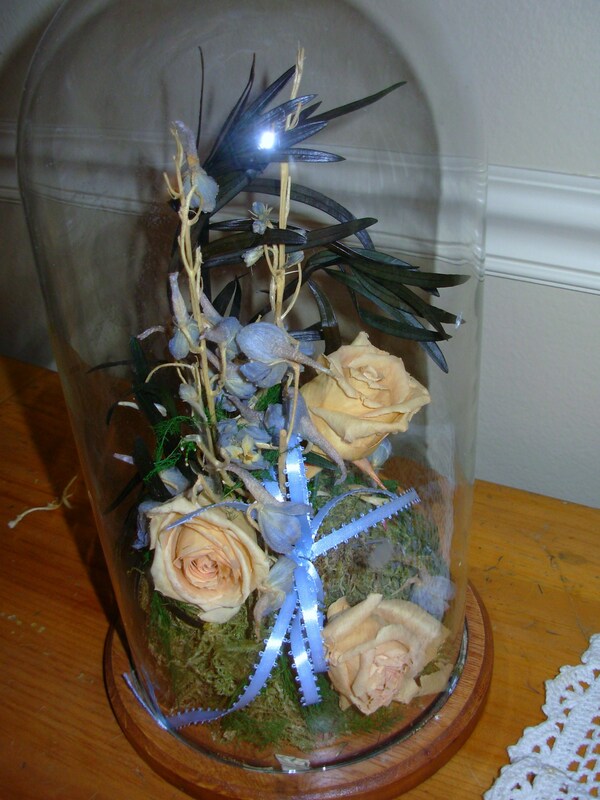 These are flowers from my Grandfather Benson’s funeral. 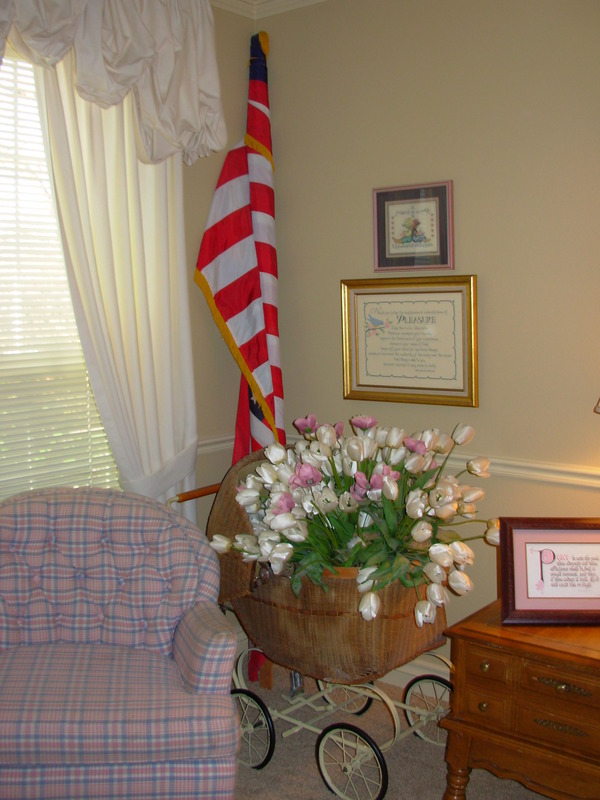 For me the U.S. flag and my family are nearly synonymous. The tulips were part of a funeral arrangement at Grandpa Hinckley’s funeral. Mom and Dad. This is a somewhat unique picture as they have ‘their own’ spots on the couch and this is backwards. 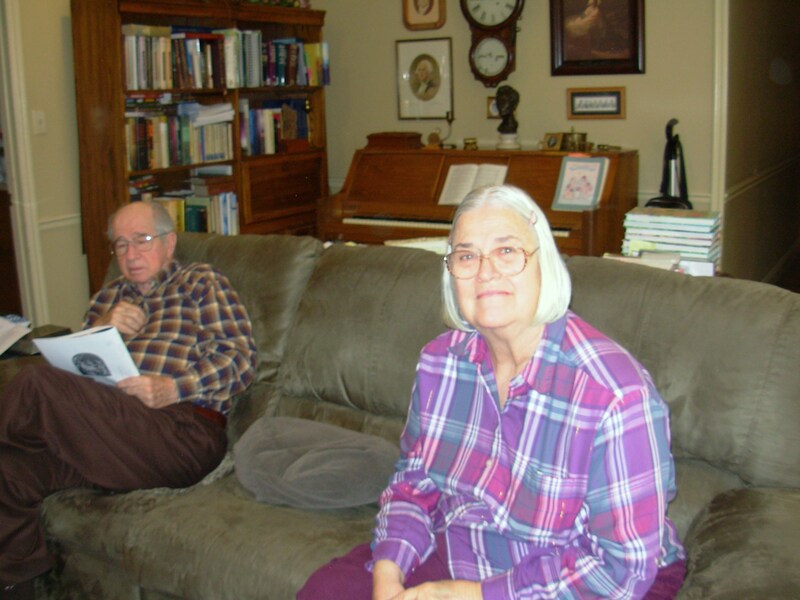 Mom looks a bit sad, although Heidi wasn’t brought up often, we all missed her. 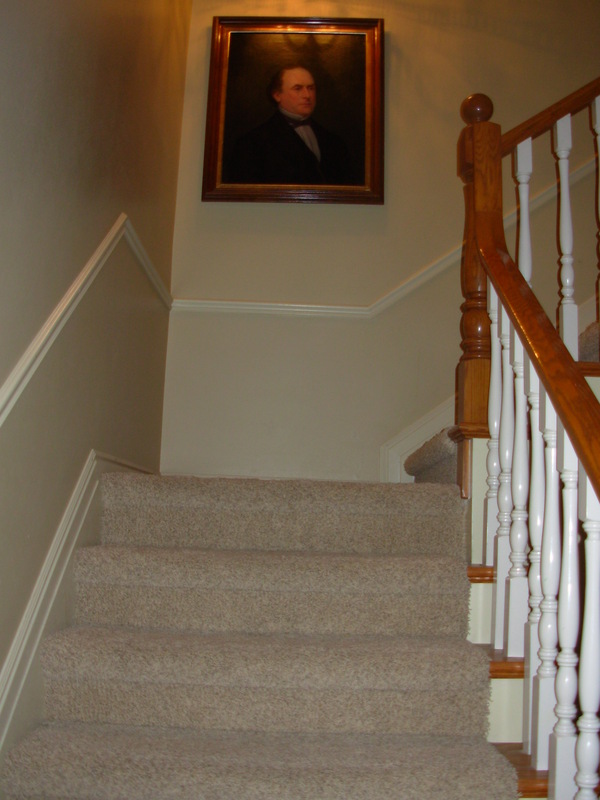 Part of the stairway and my great great grandfather’s portrait (Ezra Taft Benson). Assorted nieces and nephews playing in Mom’s front room. The beauty (well, one of many) of this room is the cupboard doors. 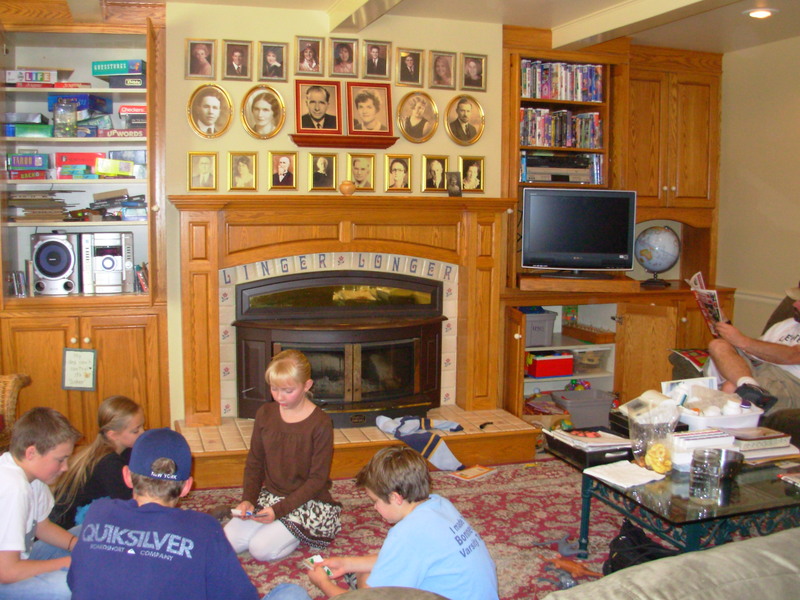 Although most are open in this photo, they all close and the room is instantly ‘company friendly.’ The photos above the fireplace are myself and siblings, my parents and grandparents and great grandparents. The hand made tiles on the fireplace surround say “Linger Longer” – it’s one of Mom’s favorite sayings. This entry was posted in knit and tagged cowl neck, Knitting, Ravelry, Thanksgiving 2009. Bookmark the permalink. Lovely photographs. I’m sure you must all have helped your parents get through this sad time for them.